This product is sold widely in Turkey and is commonly used as a salad dressing in the traditional spoon, shepherd’s or cracked wheat salads. It has a syrup like consistency, has a sour taste and is darker and thicker than the juice of this healthy fruit. Just like its source, it is rich in vitamins and anti-oxidants. Some of the popular Turkish brands of this product include Arifoglu, Camlibelde and Sera. You can find it in specialty Middle Eastern stores or online Turkish supermarkets such as Turkmarket or Tulumba. Although many households in Turkey buy this product ready these days, if you can’t find it where you live, you can also make a similar dressing at home. 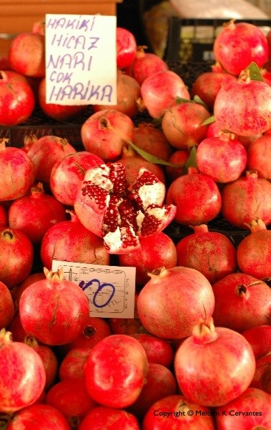 Get two pomegranates that are not yet ripe and crush them to extract their juices. Filter through a cloth to eliminate any pieces of the seeds. Boil the juice, add a tablespoon of lemon salt (or a 1/4 cup of lemon juice). Mix well and continue boiling to let it get thick, then remove from the heat. Put the syrup in a bottle, and keep it in a cool place. After a month of storage, you can use it for a delicious and healthy Spoon Salad (Kaşık Salatası). Find our recipe on EAT. Use this product on a Spoon Salad. See our recipe on EAT.